Recently, as part of a podcast production series, I was asked how I approach the technical aspects of the Macworld Podcast. In one of the first installments I described the equipment I use. At the time I employed an AKG C414 EB condenser microphone mounted on a Heil Sound PL2T boom stand run through an original Apogee One USB interface. Due to an unexpected-but-welcome tax refund and the need for the AKG mic to return to its owners (my band), I decided to upgrade my gear. These are the results. Much as with high-end audio gear and cameras, people tend to be very loyal to particular kinds and brands of microphones--embracing the mics they've chosen and dismissing those that they find unworthy. Among some podcasters you'll find a measure of emotion surrounding the question of whether one should use a condenser or dynamic microphone. In a nutshell, these are two methods by which sound is captured by a microphone. In practice, dynamic mics can generally take higher pressure levels and are more robust. (The Shure SM58 is a dynamic mic legendary for live performances because it can be used to mic just about anything and, when not used in performance, is tough enough to drive nails). Condenser microphones tend to have a broader frequency response but can be harder to "work" as it can be easy to produce plosives when too close to the mic as well as pick up extraneous sounds around it. The vast majority of USB microphones you can buy today are condensers. There are people who swear that you should only use dynamic mics for podcasting, as they are commonly found in radio stations. Others prefer condensers, which are more commonly used for recording vocals and voice-overs in professional settings. I find that with a good mic and the proper technique, either will serve. The AKG 414 is a condenser microphone and I love the sound I get from it. That said, now that it's no longer an option and I can start fresh, I have to admit that I've needed to be quite careful about its placement, where I position the pop filter that sits in front of it, and the amount of gain I use with my interface. I wondered whether a more forgiving microphone would be the better way to go. And, after a lot of research, I decided it was. In addition to scouring the web for reviews and recommendations I spoke with a few friends in the radio and professional audio businesses. They came back with three recommendations--the $450 Electro-Voice RE20, $350 Shure SM7B, and $327 Heil PR 40, with the RE20 and SM7B mentioned far more often than the PR 40. In addition to saying that "everyone uses it," people recommended the RE20 because it has a large "sweet spot." You can talk off-axis and still get great results. Fans of the SM7B like its tone and "Hey, Michael Jackson recorded Thriller with the thing so it has to be good!" 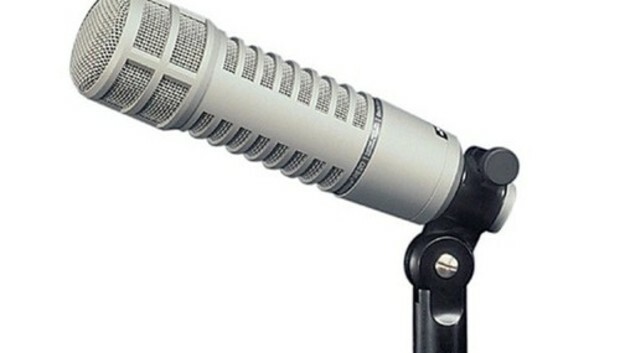 And those who recommended the PR 40 mentioned that it sounds wonderful, is reasonably affordable for a professional microphone, and is the mic of choice for the TWiT network. Although it was a close thing, I figured if I was in for a penny, I was in for a pound and went with the RE20. As with nearly all important decisions, this one had consequences. Wonderful as the RE20 sounds, it's heavy at over three pounds and it needs a pre-amp with some oomph to it as the mic offers notoriously low gain. In order to show off the mic to its best advantage, I needed to make other changes. First to go was the Heil boom stand. It's simply not strong enough to hold the microphone along with Electro-Voice's 309A shock mount when stretched out across my desk. I tried swapping in a Rode PSA1 boom arm but it too sagged under the weight. So I did as many radio pros do and purchased an O.C. White ProBoom Deluxe Mic Arm along with a table edge clamp to lock it to my desk. Next up was the gain issue. As I mentioned in my recent review of Apogee's One for iPad and Mac, the latest version of this audio interface has greater gain than the original and it handled the RE20 well. Regrettably, I have the original and while it captured the RE20 cleanly, I needed to significantly boost the results after they were recorded. I happen to have a $175 Focusrite Scarlett 2i4 USB interface that I use for music production, as it has two XLR inputs, two line inputs, and MIDI in and out ports and so I gave it a go. Although you have to peg the input knob, it produced better gain than the One and, as with the One, the results were clean. Still, after using it for a few days, I wanted more. And more is what I got with Cloud Microphones' $150 Cloudlifter CL-1. It's a smallish blue box that serves a single purpose: It boosts passive microphones like the RE20 by up to +25dB with interfaces that provide phantom power. Just put the Cloudlifter between the mic and your audio interface and you have gain for days. With it in place I can choose to work with either the Focusrite or Apogee interface. After throwing a heck of a lot of money at the solution I should be satisfied, right? For the most part I am--I have a great sounding mic that's found in pro studios and radio stations across the globe, boosted so that I have headroom to burn. But I steal the occasional look at my audio interfaces and can't help but think "If Uncle Sam were to rain down another G-note on me and I had no greater priorities, what might I add?" Universal Audio's Apollo Twin (recently reviewed by Jim Dalrymple at The Loop) is on the top of my wish list. Not only does UA make terrific sounding hardware, its plug-ins are legendary--mimicking the warm analog sounds found in the company's hardware devices. For a simple podcaster it's overkill, but as I'm increasingly doing music production work at home, it would make a wonderful addition to my setup. But at $700 for the single-core model, that, like any potential refund, will have to wait until next year.